Ecclesiastes expresses a candid familiarity with the full range of life experience, in all its beauty and ugliness. Jack Eswine's study connects these existential concerns to the person and work of Jesus. 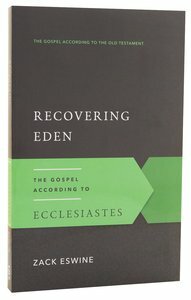 About "Recovering Eden (Gospel According To The Old Testament Series)"
Ecclesiastes shows a frank, unafraid familiarity with transparency, beauty, and ugliness. Eswines study helps us address these topics boldly ourselves and grounds them in the person and work of Jesus. Zack Eswine (PhD, Regent University) is assistant professor of homiletics and associate dean of ministry formation at Covenant Theological Seminary. He is the author of Kindled Fire: How the Methods of C. H. Spurgeon Can Help Your Preaching and lives in St. Louis, Missouri. With lucid insights on every page, After God's Own Heart examines the life of David, showing how the Old Testament king relates to anointing, covenant, the temple, and sin. But ultimately, the author shows how David pictures the Messiah to come. The book includes study questions for individual or group study. After God's Own Heart is an excellent contribution to an important series on the biblical theology of the Old Testament. As Mark Boda shows in this useful and accessible book, the House of David is central to the Bible's message of salvation. Using a thematic approach that is well-informed by careful scholarship, Boda explores David's many connections to Christ and to the church as the covenant community of David's Son." An excellent expostion from the GOSPEL ACCORDING TO THE OLD TESTAMENT series. Raymond Dillard's multi-faceted work on Elijah and Elisha draws out the essentially Christ-centred messages contained in these stories. He intends to nourish reader's faith and encourage worship and his book can be used in personal devotions, as a small-group study text, or as help for sermon preparation. Faith in the Face of Apostasy will help readers understand the stories in 1 and 2 Kings as part of the over-arching story of God that culminates in the life of Jesus. "One of the most urgent needs of the church is to grasp how the many parts of the Bible fit together to make one 'story-line' that culminates in Jesus-Christ. This series of books goes a long way to meeting that need. Written at a thoughtful but popular level, it deserves wide circulation." - D A Carson. In Exodus, Numbers, and Deuteronomy, Moses is not just God's chosen leader of the Jews but also a precursor of the future Messiah, Jesus. Anthony Selvaggio focuses upon the redemptive-historical aspects of Moses life.